Pavilion St Clair 'The countryside at the edge of water' + 2 bikes + Wifi! The Pavilion located on Mont St Clair looks at the sea. 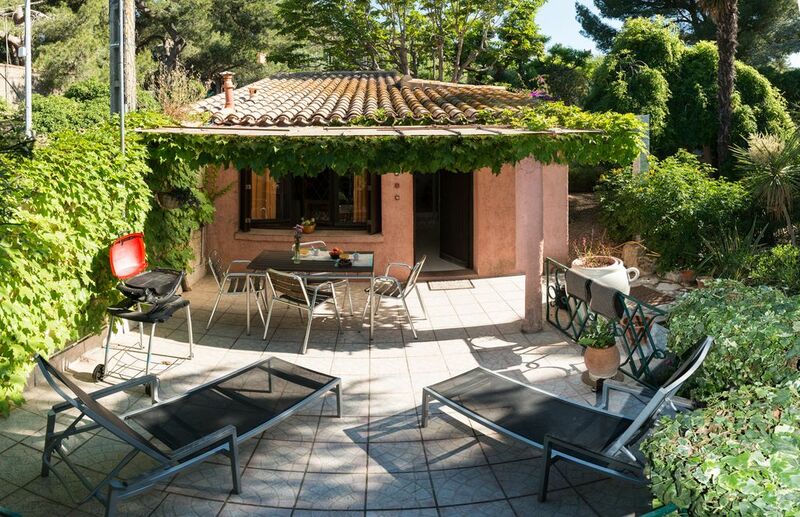 agency owner of villas in Sète is pleased to welcome you to Pavillon Saint Clair. Important note: The booking will be definitively accepted only once the contract filled directly on our site locasete. fr and returned signed. The Pavilion St clear with the neat interior decoration is located on the Mont St Clair full south looking at the sea. Located on the same plot of 1000 M2 as our own villa but with an individual entrance, each house is located at an opposite end of the land which allows the independence of each. Free outdoor parking, so go down on foot (count about 10 minutes) in the neighborhood of the cornice where are shops, restaurants, casino and the beach nearby. Pavilion with a beautiful terrace overlooking a garden planted with Mediterranean species cactus, pines, almond, olive, mimosas enjoy the sun discreetly in a beautiful area with outer stone cuttlefish walls. Very rare in Sète you will be delighted by the calm and the authentic aspect of your holidays. All year long enjoy an excellent starting point to visit the city and the region. Info Golf: Golf Cap d'Agde Designed by the talented Ronald FREAM, is an invitation to sporting challenge. Fashioned in the heart of a sublime Mediterranean landscape, the Golf du Cap d'Agde offers magnificent undulating greens, water hazards and carefully positioned bunkers. A driving training center 36 stations including 16 covered, a putting green and an approach green are available. Changing rooms are available as well as equipment rental. The clubhouse has a pro shop but also a bar and restaurant "La Pleiade" to meet friends after an enjoyable round of golf. Charm and friendliness characterize this place whose exceptional location offers stunning views of the course. Golf 18 holes of Montpellier Massane International, designed by Californian architect Ronald Fream in 1988, was designed to provide a unique golfing experience. all we needed in a compact space. terrace ideal. The cottage was well equipped, clean and comfortable. For someone with slight mobility problems (me), the steps from room to room were a problem as there were no rails or handles to assist. The sheltered terrace was a delight, with views down to the sea, and comfortable seating. I would be happy to recommend this cottage. We enjoyed the regular company of a handsome cat. Petit cottage bien aménagé , avec une terrasse qui offre une très jolie vue sur la mer, entouré d'un beau jardin au calme et les hôtes sont très accueillants et pleins de ressources! Nous avons passé une agréable semaine. Petite maison de caractère , il n y a cas posé ses valises . Vu sur la mer reposant. Merci. Surrounded by water on all sides, Sète, nicknamed the Venice of Languedoc, has the charm of a fishing town. It reveres the memory of poet Paul Valéry and Georges Brassens singer, both born in Sète. It is an attractive city whose docks are very busy. You can visit the Paul Valéry Museum and the Georges Brassens Space, the library, the Molière theater. Sète also has an "International Museum of Humble Arts," a casino. The marina is adjacent to the auction and many restaurants will show you the sétoise gastronomy (tial, stuffed squid, macaronade, grilled cuttlefish ...). The Theatre of the Sea, old fort overlooking the Mediterranean, hosts music festivals throughout the summer. The feast of Saint Louis in late August is the opportunity to attend the famous final jousting with music and bodega around the royal setting. The beach of the lido extending over 12 km you will also enjoy the pleasures of idleness. Rental boats and jet-ski: On the Lido beach summer you can rent jet skis and motorboats with and without a license. You can also pass the French boat license in a few days! Be sure to visit the canals of Sète by boat you will have a totally different picturesque view of the city, continue your walk by heading to the area of ​​the 'quilt' and you will be on the pond of Thau. From there, head for the oyster parks Bouzigue, stop to eat some oysters and white wine Picpoul and it is returned to Cap d'Agde. Then turn back to Sète through the sea along the beaches of Rochelongue or if you have time continue your trip on a small portion of the Canal du Midi with its locks, its barges and its ancient trees! In short a great holiday in perspective. N''hésitez not to wonder about the cultural and tourist visits in the area! Sète is the first French fishing port for tuna, huge tuna are moored in the city center with their prominent fishing net on the docks. The area of ​​the quilt in Sète is very picturesque, it is a fishing district on the edge of the pond of thau lively summer evenings where you can have a drink and eat delicious skewers evening. Fishing for bream in October when the fish leave the lake to reach the sea is the opportunity to witness an incredible sight, hundreds of angler crammed against each other to bring the most bream possible. The jousts: Bleachers installed during the Saint Louis along the Royal Canal of docks, one can witness spectacular fights. These struggles are called games. For the winner of the biggest tournament of St Louis is the assured immortality since 1666, his name is engraved for posterity on a shield, in the hall of the Museum Paul Valéry games ... More than a sport, beyond the folklore and tradition, jousts reflect the soul of Sétois! The boats are propelled by 10 oarsmen, solid fishermen mostly controlled by a patron-experienced helmsman at the front of the boats, an oboe and a drum play the traditional air jousting at the time of the fight, and traditional tunes Languedociens between passes. Marching bands based in the stands 'hot' atmosphere and welcome the victorious tilters and spectacular passes with great bursts of brass and bass drums! This is especially the summer you attend this wonderful show. Info Golf: Golf Cap d'Agde, is an invitation to sporting challenge. Fashioned in the heart of a sublime Mediterranean landscape, the Golf du Cap d'Agde offers magnificent undulating greens, water hazards and carefully positioned bunkers. A driving training center 36 stations including 16 covered, a putting green and an approach green are available. Changing rooms are available as well as equipment rental. The clubhouse has a pro shop but also a bar and restaurant "La Pleiade" to meet friends after an enjoyable round of golf. Charm and friendliness characterize this place whose exceptional geographic location offers stunning views of the course. International Golf 18 holes of Montpellier Massane, designed by Californian architect Ronald Fream in 1988, was designed to provide a unique golfing experience. Taxe de séjour :0,99 euros par personne et par nuit Location de draps : 15 euros par lit En dehors des périodes de juin à septembre nous acceptons des locations modulables dans le temps. Attention homeaway-Abritel vous prélèvera ses frais de service (frais qui rémunèrent sa mise en relation entre locataire et propriétaire) sur votre carte bancaire et il faudra nous régler directement le prix du séjour par virement. IMPORTANT A LIRE CAR IL Y A SOUVENT DES INCOMPREHENSIONS SUR LE FONCTIONNEMENT SUR CE SITE DE RESERVATION : Lorsque vous confirmez à homeaway-Abritel que vous nous avez payé cela veut dire que vous nous avez envoyé le virement bancaire (le paiement n'est pas prélevé sur votre carte bancaire), pour cela il faut d'abord remplir votre contrat sur notre site locasete.fr en cliquant sur la semaine choisie et attendre d'avoir reçu le contrat sur lequel est inscrit notre iban, vous avez alors 7 jours pour nous envoyer le règlement , si passé cette période le paiement n a pas eu lieu la réservation sera annulée.